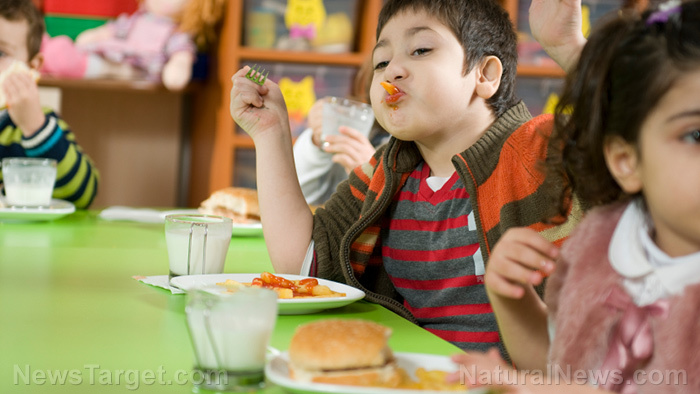 (Natural News) A concerning new study has found that children in Canada are being deprived of the nutrients they need when they eat lunch at school. The study, which was led by Ph.D. candidate Claire Tugault-Lafleur of the University of British Columbia’s Human Nutrition Program, was the first to examine the differences between the dietary intake patterns during school hours and those outside of school hours. Tugault-Lafleur and her team of researchers looked at 4,827 children throughout Canada aged 6 to 17. The respondents detailed the food and drinks they consumed in the preceding 24 hours of being surveyed, and the researchers compared the nutritional profile of the food consumed between 9 a.m. and 2 p.m. at school with the food they ate outside of school. They found that children consumed around a third of their total daily caloric intake during school hours, yet their intake of dairy products in general and vital nutrients found in milk like vitamin D and calcium was lower during their hours at school than the rest of their day. At the same time, their intake of less-than-healthy foods like salty snacks, candy, and sugary drinks was comparatively higher during school hours. They carried out their analysis using a School Healthy Eating Index they devised based on 11 vital components of a healthy diet. The maximum score is 100 points, and the average for all of the nation’s schoolchildren was a measly 53.4 points. A few sociodemographic differences also emerged. For example, the diet quality scores while at school were 9 points lower on average for those aged 14 to 17 than those aged 6 to 8. In addition, children from families that had post-secondary education had a statistically significant two-point higher average than other children. When it comes to location, Quebec children had at least five points more on average than their peers in Manitoba, Ontario, Labrador and Nova Scotia. The diet component that earned the poorest score in schools was dark green and orange vegetables, which only garnered 20 percent. Any score lower than 50 is poor, with 80 percent or more representing a high-quality diet. Whole grains didn’t perform much better at less than 30 percent, while whole fruit only managed 40 percent. Milk products earned a grade of 50 percent, while the categories of total fruits and vegetables, sodium, and meat and alternatives notched up 60 percent each. The data pertaining to the children’s meals came from a 2004 Canadian Community Health Survey. Next, the researchers would like to compare this data with a new set from the 2015 version of the health survey that will be released soon in order to see if any of the various school nutrition policies or other initiatives that have been introduced in the intervening years have made a difference. The situation isn’t much better in the U.S., where a team of researchers discovered that children who regularly ate meals from the school lunch programs supported by Michelle Obama were more likely to end up obese or overweight than those who did not participate in such programs. Moreover, the researchers discovered that the longer the students were enrolled in the school lunch program, the higher their risk of being overweight was. The problem was particularly prevalent in the Northeast, the South, and rural areas. It’s clear that North American schools are failing our children when it comes to food. It has never been more important to pack your kids a balanced and nutritious lunch composed of clean and organic foods that you know are free of GMOs and other toxic ingredients. Teach your kids what constitutes a healthy diet, and make a family project out of growing your own food. Now is the time to establish habits that will enhance their health throughout their lives.